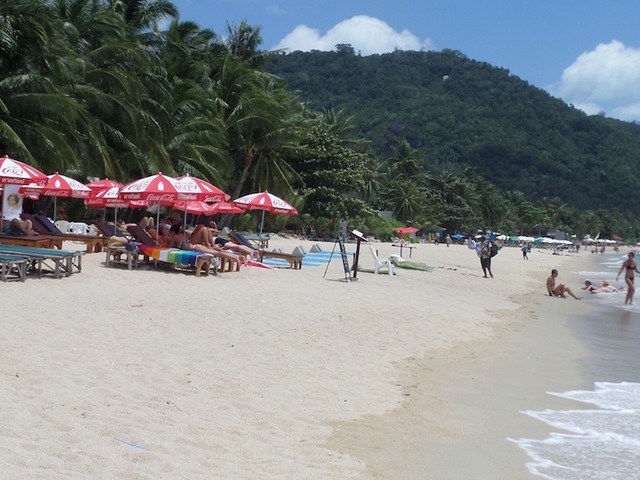 Lamai is the second most popular spot for holiday visitors to Koh Samui, although it is much quieter than neighbouring Chaweng it is still a very lively resort, but with a laid back feel. Lamai has long stretches of powdery sand beach and clear calm water, great for swimming all year round on the southern part of beach. The beach has a wealth of activities to try like jet skiing, a children's water park and even the Jet Lev jet pack water experience. There are a large selection of restaurants and bars to choose to from in the area, both beachside and in the town. Like it's neighbour Chaweng, the area attracts young travellers looking to enjoy a party vibe, but this is mainly concentrated to the central area of Lamai Town. 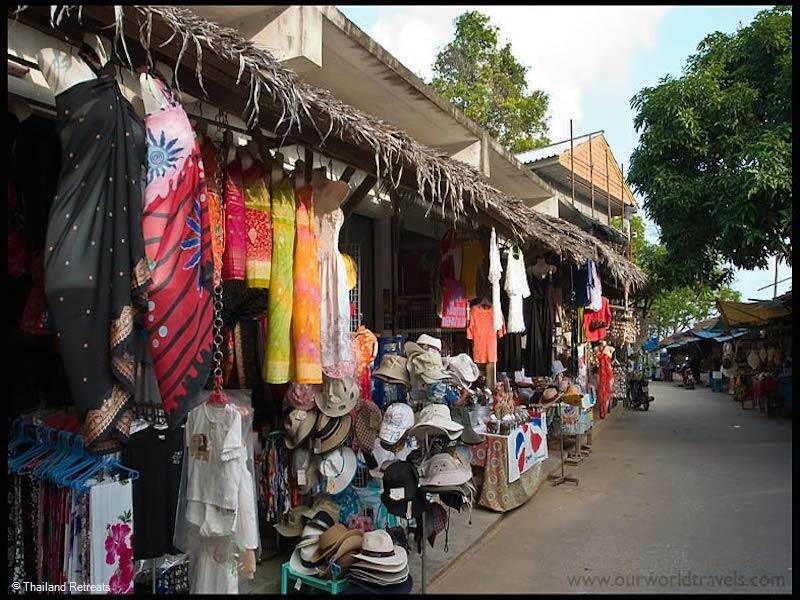 Lamai has a range of shopping opportunities - as well as the Tesco lotus and shopping centres, you can enjoy the bustling 'walking street' markets with mouth-watering street food. For the ultimate relaxation, head to one of the world famous luxury spa's like Tamarind Springs or enjoy a round of golf at the Royal Samui Golf and Country club. 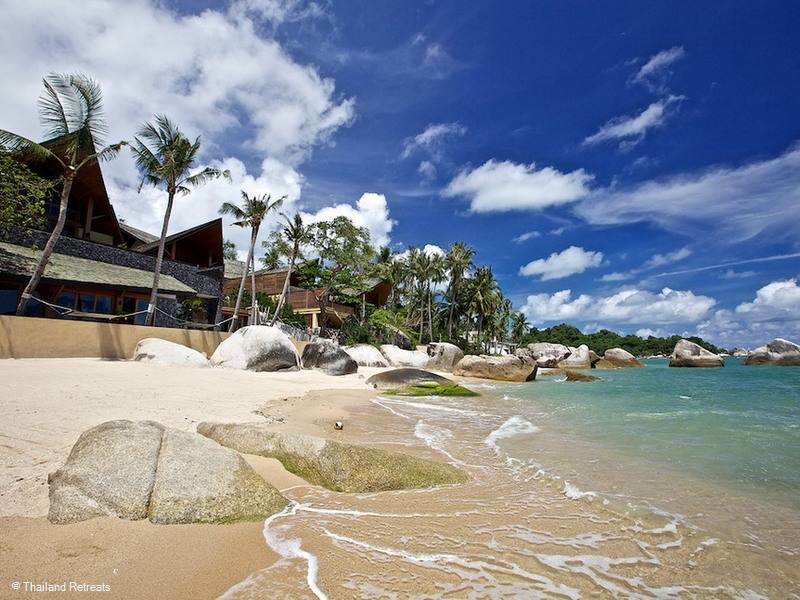 Lamai boasts a mile long stretch of sandy beach and is one of the best beaches on Samui. The beach is wide and clean and is suitable for swimming. The beach is accessible from the town and there is a large range of beachfront accommodation to choose from. There are plenty of watersports like kayaking, jetskiing and jet lev jetpacking available here. The northen end of the beach is shallower and rockier, but can be great with small children. There are a number of restaurants and bars dotting the coastline, so you can enjoy a fresh smoothie or something a bit stronger to watch the sun go down. 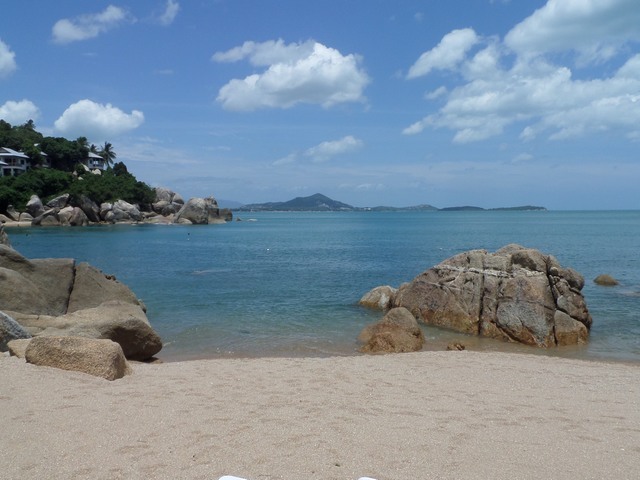 Located on the hillside road between Chaweng Noi and Lamai, you have to know about this beautiful beach to find it. The beach is only 180 yards long and is accessed down a pathway and steps through a bungalow resort. Large boulders occupy both ends of this small and pretty beach, which is almost private to the bungalow resorts. Although the sand is more yellow and grainy than other beaches, the water is as clear as it could be and great for swimming and snorkelling all year round. Located on the road from Chaweng to Lamai, this quiet sandy cove is ideal for families with shallow clear water and boulders to play on and shade provided by the overhanging trees. The atmosphere here is fun and relaxed. Without spoiling the reason these rocks are so special, let's just say Hin Ta and Hin Yai raise indulgent chuckles from those who go to see them. Koh Samui's Mummified Monk at the beautiful temple of Wat Khunaram, offers a unique insight into Buddhist and Thai culture. Every Sunday, in between the fresh food market and the bridge to the beach is Lamai's long, wonderful walking street. The street is bustling with stalls selling wonderful clothes, handicrafts and delicious street food. The area is full of Thai locals, ex-pats and tourists so prices are cheap, and the food is fantastic. The night plaza can be found not far from the McDonalds on the main road. It is on a side street and opens from around 18:00. There are many stalls selling all kinds of souvenirs, handicrafts, jewellery, and art. Similar to those you will find on a Sunday night walking street. 'Buddies' is a sleek western style shopping plaza hosting small, stylish boutiques, coffee shops, spas, restaurants and even a kids club. Tesco Lotus is akin to every other supermarket back home. However, there is also a small mall complex attached to the supermarket with a 'Boots' chemist, small boutique shops selling clothes, watches, beauty products and electronics. There are also fast food restaurants including KFC and Black Canyon Coffee. A great option if you are self-catering or are missing some home comforts. Found next door to the petrol station on the main road this is the authentic Thai equivalent of a grocery store. Lamai's market is a bustling hive of activity, selling fresh food necessities and takeaway street food. Lamai also boasts a daily 'Night Market" (not far from the night plaza) where you can find delicious Thai and western cuisine to eat among strangers and friends under the stars. This area is called the 'central plaza' and here you will also find small boutique shops, bars and restaurants. 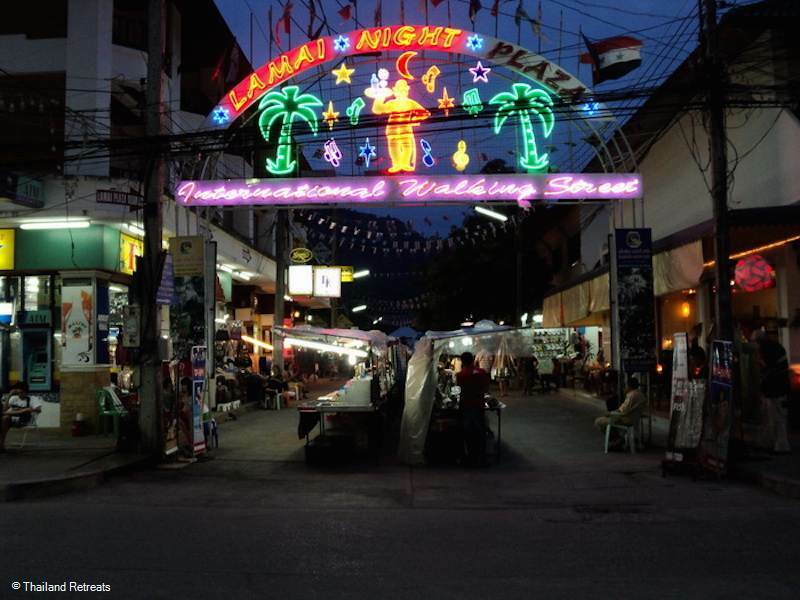 The night market is all centred around one of the best free shows on the island, the Saturday night 'Thai Lady Boxing'. It's certainly an experience and great fun to watch, be sure to arrive early as the area gets very busy at the weekend. There are many Thai style massage shops and beach huts offering excellent service and facilities along the main road in Lamai. You can experience an amazing full body massage for around 400THB or be pampered in the spas of the luxury beachfront resorts. One of Asia's most acclaimed Spas, set in a beautiful and magical location in a natural environment. Thoroughly recommended for visitors to connect with nature and experience a level of relaxation and tranquillity second to none. The Spa Samui Beach Resort was Thailand's first destination-health spa and now has an additional spa set high on rock formations overlooking the beach offering detox cleansing, healthy eating advice, exercise, meditation and peacefulness. 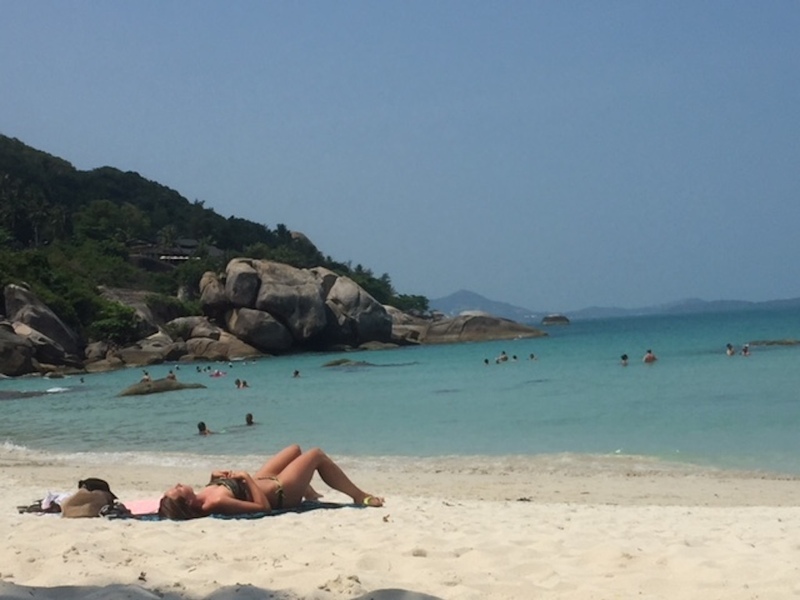 South East -also known as Thongthakian Beach on the road from Chaweng to Lamai this quiet sandy cove is ideal for families as there is shallow clear water and rounded boulders for the kiddies to play on. Shade is provided by the overhanging trees - no sun loungers or umbrellas. South East - Steep steps lead down to this beach through a bungalow resort located close to Crystal beach on the Chaweng- Lamai ring road. Bordered by large boulders this small beach is a private paradise with the boulders creating other smaller beach coves. 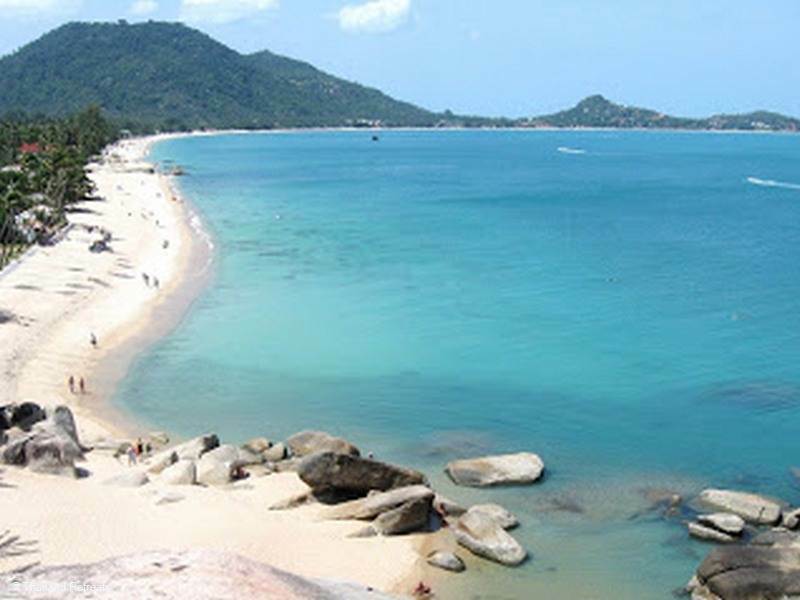 South East - The second most popular beach after Chaweng beach which is 3km long with white sands, clear water. The best part for swimming is the south end where it has the widest strip. The centre and south end of the beach has a good choice of restaurants. Located in Rocky's Boutique Resort, specialising in exquisite French and Mediterranean cuisine. Also located on the ring road between Lamai and Chaweng, another award winning restaurant offering exquisite Thai and Italian cuisine, with excellent soothing live music most evenings. Thai fine dining in a beautiful restaurant setting or choose casual beachfront dining at Rocky's Boutique Resort. Lovely tapas, Latin music, amazing cocktails. They have a live acoustic Spanish guitar player twice a week. Beach republic resort offers all day dining, but our favourite is the spectacular all you can eat Sunday buffet brunch set to cool DJ beats against a spectacular ocean front setting. The nightlife here is concentrated in the centre of Lamai town. There is a vast array of bars, clubs and restaurants to suit all tastes and budgets and it's easy to find one that suits your particular taste - whether you want to sit on a swing and sip cocktails, hear live music or prefer to quietly enjoy a fine wine. A large lively beach bar with rope suspended swing seats at the bar, overlooking fire dancers and fireworks on the beach front. Ideal for sports fans and live music lovers. Featuring excellent DJ's and an electric atmosphere.